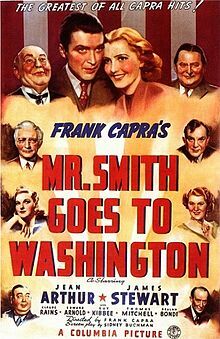 In Mr. Smith Goes To Washington, Jimmy Stewart’s character (Jeff Smith, natch) is a dangerously ignorant rube. For a short while, his awe of Washington D.C. is charming. After a few scenes of his ADHD “look at that” sight-seeing, you have to wonder if he’s going to get mugged by somebody while he’s staring up at the Lincoln Memorial. Even his associates lose patience with the enthusiastic hayseedery. Jeff is just lucky that Saunders (Jean Arthur) doesn’t have the same amount of contempt for him that Arthur had for Stewart’s performance. Still, there’s something special in the final 30 minutes of this picture as Jeff filibusters on the Senate floor. It’s cornball and as unsubtle as punches to reporter’s faces, but Jeff’s fight for his political life represents all the little people out there who feel steamrolled by The Man. You know, 99% of us. And the movie has endured. The American Film Institute ranked it 29th and 26th, respectively, on their 1998 and 2007 Top 100 lists and they made it their 5th Most-Inspiring movie. Ol’ Jeff Smith was their 11th best hero. Men who won’t shut up and then faint at critical moments are cheer-worthy! At least the excellent Claude Rains is around to give the flick gravitas, even if his change of heart at the end is staggeringly unbelievable. Thomas Mitchell’s hard-drinking reporter is fine too and Harry Carey (as the Vice President) is a sneaky delight. As for Jimmy Stewart, something must be cleared up once and for all. It’s not that he led a one-man filibuster. It’s just that his slow-talking stammer made his speech take all night. Hi-yo! Thanks, you’re a beautiful audience. I’ll be here all week. Probably filibustering.